Buddhism does not believe in the abiding nature of a supreme identity, god, spirit, or ghost. However, it does not deny that the Human condition has Divine potential. Based on ideas of the interdependence of origination and existence, the non-abiding nature assumes various identities. One may think I am rich or poor; I am a businessman or a housewife; I am happy or sad; or I have seen and experienced the abyss or beyond the infinite. Such various states or identities are similar to the earth, sky, clouds and sun being reflected in water. Here water's transparent and mirror like reflective quality metaphorically symbolizes qualities of consciousness and awareness. Liberation depends on not being trapped by the forms of the referencing mind. The referencing mind can become caught in the imagery of compulsion and polarized positions, fictitious fantasy, or the dichotomy of separateness and duality versus non-duality. Vajrayana Buddhism employs the skillful means to activate the Divine Covenant inherent in the human potential for Freedom and Enlightenment. The Biblical vision below also helps to reveal the Divine symmetry, Mandala, of the energy potential of freedom for humanity. "And I looked and behold a whirlwind came out of The North, a great cloud, and a fire enfolding itself, and a brightness was about it, [...] out of the midst of the fire [...] came the likeness of four living creatures [...] they had the likeness of a man. And everyone had four faces and everyone had four wings [...] and they had the hands of a man under their wings. [...] Their wings were joined one to another; they turned not when they went they went everyone straight forward. As for the likeness of their faces, they four had the face of a man; and the face of a lion on the right side; and they four had the face of an ox on the left side; they four also had the face of an eagle. And they went everyone straight forward; whither the spirit was to go, they went; and they turned not when they went. [...] And the living creatures ran and returned as the appearance of lightening. Now as I beheld the living creatures behold one wheel upon the earth by the living creatures and his four faces. The appearance of the wheels and their work [...] they four had one likeness and was as it were a wheel in the midst of a wheel. When they went they went upon their four sides; and they turned not when they went...and when the living creatures went the wheels went by them and when the living creatures were lifted up from the earth the wheels were lifted up. Whither-so-ever the spirit was to go they went, and the, wheels were lifted up over with them, for the spirit of the living creatures was in the wheels. Over the heads of the living creatures there was the likeness of a firmament, shining like a crystal, spread out over their heads. And under the firmament their wings were stretched out, one toward another." 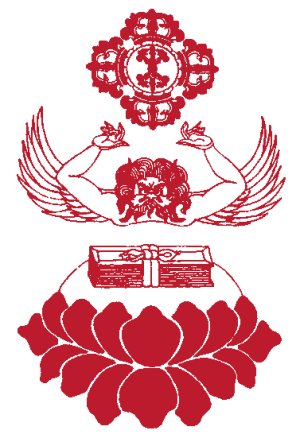 Similarly in Buddhism the Garuda, a symbolic being with the wings of a bird, the mane of a lion, the horns of a bull and the arms and hands of a man, is integrated into a wheel called a Vajra Mandala. Whether or not Vajrayana Buddhism and Christianity coincide, from a historical reference point or an archetypal one, is a peripheral issue. The main issue is the visionary and energy potential processes of the ancient knowledge and its proper use and continuity to bring value to Mankind, Society, and the Environment. "And above the firmament over their heads there was the likeness of a throne, in appearance like sapphire; and seated above the likeness of a throne was a likeness as it were of human form [...] I saw as it were the appearance of fire, and there was brightness round about him. Like the appearance of the bow that is in the cloud on the day of rain, so was the appearance of the brightness round about. Such was the appearance of the likeness of the glory of the Lord. And he said to me, 'Son of man, stand upon your feet, and I will speak with you.' And when he spoke to me, the Spirit entered into me and set me upon my feet; and I heard him speaking to me." To this end, included among the various skillful means that Vajrayana Buddhist employs, are the internal tantric yoga practices of invoking the Divine through symbolic ritual practices. These practices train the mind to be free of its negativity and open the door to enable one to recognize the state of the liberated nature of Mind. These subtle yoga mind-training practices have been commonly referred to as the Generation and Completion Stages. They are based on the Mahayana, (Open or Great Path), principles of developing Bodhichitta, which is altruism; and the Fundamental principle of Vipashyana, which is insight or recognition that the Natural Awareness can be unimpeded, fathomless flawless, free of concepts, compulsions and identifications, even as they arise. These practices lead the channels of the body and the senses, the vibratory winds, including thought and emotional energies, and the essential awareness to experience and recognize the nature of Mind. In part similar to modern physic's string theory, Buddhism also believes in a centerless universe which does not have an abiding nature. As with the whirlwind quoted from Ezekiel's vision above, and ‘in the beginning’ of the book of Genesis, the Generation Stage is based on a state that is ‘without form and void’. As in the seventh day of rest, the cycle finds Completion through rest from activity. Through implementing the ritual process, the compulsive neurotic forms of grasping and manipulation along with their negative emotions and thoughts are harnessed and transformed. The concrete concepts and the afflicted identifications of a doer become dissolved back into the primordial formless potential. The entire practice begins and ends dedicated to the benefit of all beings. Similar to the 'holy city, new Jerusalem’ in the book of Revelations, the world is reborn, set to arise empowered with the potentials of Enlightenment and Spontaneity. When one is alienated from ones essential nature, the world appears demonic and intuition cannot function. The threats and distress of war, financial and social disorder, love and family problems, sickness, old age and death seem like insurmountable dilemmas. Training one's mind to recognize its original nature removes the illusory veil of separation and alienation from the world and its order. Recognition of the Nature of Mind can lead to Liberation if one can maintain the continuity of that recognition. Chaos can be transformed into harmony, balance and clarity. The root of the Sanskrit word Yoga is related to the English word Yoke; to harness. Some have interpreted the yoking to mean a union as in joining the individual with the Cosmic Consciousness. However, one cannot join what has never been separated. Similarly in the Book of Genesis God says “Let Us make Man in Our Image”. There is no joining. It is that way from the beginning. So the proper interpretation of yoga is the harnessing of the instinctual mental and emotional energies that move through the body's channels to clear away the delusional deviations and distortions that fabricate alienation and separation. Nevertheless there can be value in the use of the metaphor of joining and union. Such an example is not necessarily a mistake. For example, it is not considered a mistake to first explain the simpler concepts of Roman numerals as depicted as ‘III’, before teaching the more sophisticated symbols of Indian numerals depicted as a “3’ (The Arabic numerals are actually Indian numerals that the Arabs introduced to Europe.) In any case, yoga is another valuable vehicle that can be used to awaken one's dormant potentiality. The various physical disciplines of numerous cultures, like physical yoga exercises, can increase the subtle energy currents in the channels of one's body. Similarly, when one throws a ball at 10 or 50MPH there is a corresponding degree of intensity. Great strength can also manifest great harm. The power that one releases can also bounce back. Exercise is not a cure-all. While exercise can provide temporary liberation from the gravity of circumstance, the law of cause and effect follows like a shadow. Thus it is imperative to not only master the disciplines of the body, but to also train one's intentions, and to awaken the subtlety of insight and clarity of the heart and mind. The Native Americans have an expression, “Snake does not bite Man; snake bites what Man thinks.” Vajrayana Buddhism also has a saying, “the Mind is like a legless rider; the body is like a blind horse.” They must work together or they are stuck. All meaning is based on symbol, whether the symbols are the words and idioms of a language or the abstractions of pictures and equations. When a nation uses a seal or a flag, it is understood to be a symbolic representation of the nation for which it stands, and not the actual nation itself. Similarly one area of human ability to transform energy that uses equations, patterns of symbols is science. An example of the use and implementation of symbols is the ability to take the movement in elements such as water and wind and amplify it via wheels and spinning tops such as turbines to release the raw energy potential and create electricity. A further level of refinement of the human endeavor to transform energy is the ability to use raw electricity in more subtle ways, such as in light bulbs, radios, telephones, optics, lasers and computers. Wireless electronic communication transmission is now prevalent. Modern instruments have been able to reveal some of the mysteries of the electro-magnetic wave vibrations that we are a part of and that surround us. These processes have been revealed, explained and communicated through the use of equations and symbols. Modern physics now understands the atomic nature of the universe to be similar to the Mahayana metaphor of "Indra's Net." 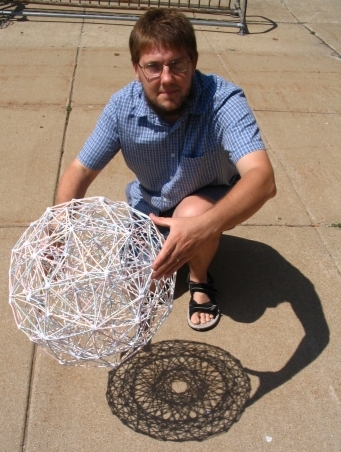 The mathematical equations of physics picture the underlying forces, particles and other atomic elemental constituents that manifest the universe and our time space continuum, to be a symmetrical geometric design similar to the Mandala. 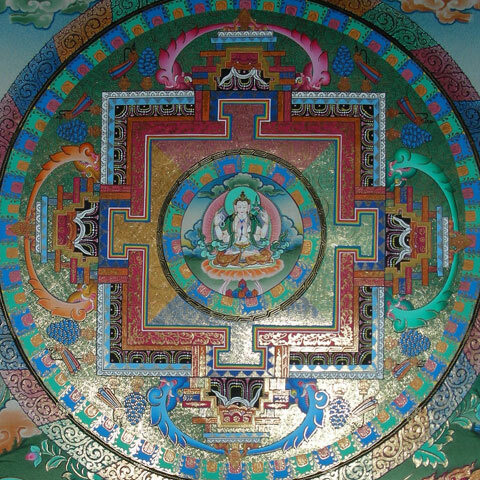 Similarly symbols, equations and metaphor are also used in Vajrayana Buddhist Internal Arts and Sciences to work with the body’s, vibratory winds and energy vortexes. The continuum of the senses, the physical body, and the mind-consciousness can be expressed as an equation of subtle channels and chakras inside a greater Mandala. This expression can be used to harness and transform the base mental and emotional perceptions, the raw elements of the body-energy-mind continuum. Perhaps the parable below gives us one of the best examples of what this transformation of energy means. "And the angel of the Lord appeared unto him in a flame of fire out of the midst of a bush: and he looked, and, behold, the bush burned with fire, and the bush was not consumed." Ordinarily one's negative emotions are considered to be poisonous and to create negative karma, i.e. they burn us up and consume us. However there are teachings in the unbroken living Vajrayana Buddhist tradition that explain how not to be divided from your emotions or your natural mind. Perhaps like the Vajrayana Buddhist tradition, Exodus was also a story of how to understand the use of power and energy so as to be like the burning bush that does not consume itself. Similar to maps, which employ symbolic references that enable one to recognize where one is and enable travel from one place to another, symbols and metaphor are used to explain and apply these processes. But, one must be able to relate the landscape with the legend of the map. Psychiatrists suggest that response to certain images, archetypal patterns, is innate. The human mind can naturally understand the expression of the symbol. On the other hand, musical images, another form of rhythm and vibration, are recorded on a score with notes as the symbol for frequency, pitch and tone. Understanding comes through experiencing the energy communication that the symbol suggests. The orchestration and notation of a symphonic score would be valueless to a person who had not first heard and understood the symbolic meaning represented by the notes of the score. To some persons the meaning of the images and symbolic expressions is innate or easily assimilated and to others they are foreign and must be interpreted and learned. If just the Vajrayana Buddhist scriptures were to survive, their meaning and value to mankind would be lost, like a buried relic in a dim past. The cipher or key that unlocks the door for human understanding, whether in Art or Science, has always come through Man's mind, in a direct living transmission of a teaching. It is important to save the oral and mind transmissions embodied in living beings, otherwise only a skeleton of the Wisdom Traditions would remain. Scientists may be able to extrapolate from a skeleton the internal organs and sense organs that were attributable to it. But they cannot decipher the workings of the mind. From a human skeleton they cannot reveal the communication potential of a Mozart or Einstein, let alone the vibratory content and meaning communicated by a living liberated individual approaching Enlightenment. The origins of both Christian and Buddhist icons are derived from the ‘ideal proportions” found in Greek art. The image above holds a vase and is representative of the Bodhisattva Maitreya, the next Buddha of the coming era. This iconographic symbol dates from between the 1st and 4th centuries C.E. It is from the Kingdom of Ghandara, which was situated in northwest India between Persia, Russia, Tibet and India. Time, war and conquest have fragmented the wisdom traditions inherited from antiquity. The Eleusinian Mysteries, rites on death and regeneration that all great classical thinkers were initiates and practitioners of, disappeared with the advent of Christianity. Similarly the indigenous Western European traditions vanished. The ancient Judaeo-Christian tradition also suffered greatly, first with the Roman persecutions, and later by internal conflicts, as the early church debated the meaning of Man's Divinity. Even the Book of Revelations was almost destroyed. Much of what was lost may never be rediscovered or understood. During the Islamic invasions of the 1Oth to 14th centuries, Vajarayana Buddhism was also erradicated from its Indo-European homeland. Several centuries prior, the complete Vajrayana transmissions and teachings were brought to Tibet. For over a thousand years they have been preserved and exemplified. The picture above is of a Tokarian. They were Caucasians with red and blonde hair, and blue, grey and green eyes. Sometime around the Common Era, [C.E. ], Tokarians learned and absorbed the Vajrayana Buddhist Traditions and made them their own. Perhaps, in a similar way that the Tibetan people did. 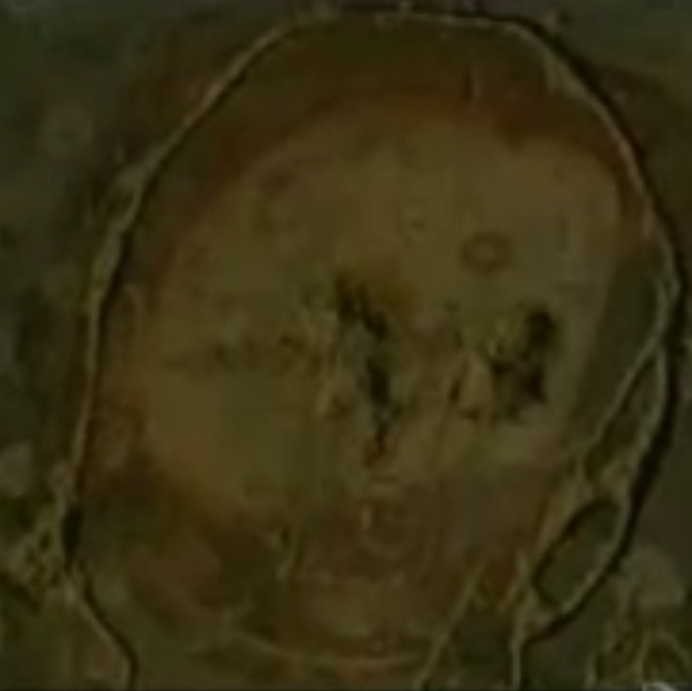 Like the statue of Maitreya with the cut off left arm above, this icon has also been mutilated. The shaman priestesses of the Tocharians' ancestors wore the conical witches hat, wove tartan cloth similar to the Scottish kilts and other plaid cloth. They had settled in the region adjoining North West India, North of the Tibetan Plateau, before the Egyptian pyramids were built and before there was a Silk Road. They were Vajrayana Buddhist Lineage Holders who also disappeared along with the other Vajrayana Buddhist traditions in North West India during the invasions of the 11-14 century. With the invasion and devastation of Tibet in the 1950's, only a few of the learned Lamas, holders of the wisdom transmission, were able to escape to India. Although the government of India warmly received them, the poverty of their environment presents obstacles to continuing higher education. In only one generation the deeper meaning of the mystic language can be severed: disconnected forever. This would be a tragic loss to mankind, for this wisdom is nonsectarian and belongs to the whole of humanity. The West is fortunate to be open to new ideas in Art and Science and generous to recognize the value of education. This luxury developed our advanced technologies. Consider the enormity of losing an entire science, such as engineering or medicine. The education required for an individual to become a mediator, for himself and others, with the archetypal laws and healing principals of existence is an Art and Science in itself and is at least as difficult to attain as an advanced degree in the West. Buddhism is the English word used to name the followers of the Holy Dharma as propounded by Shakyamuni. 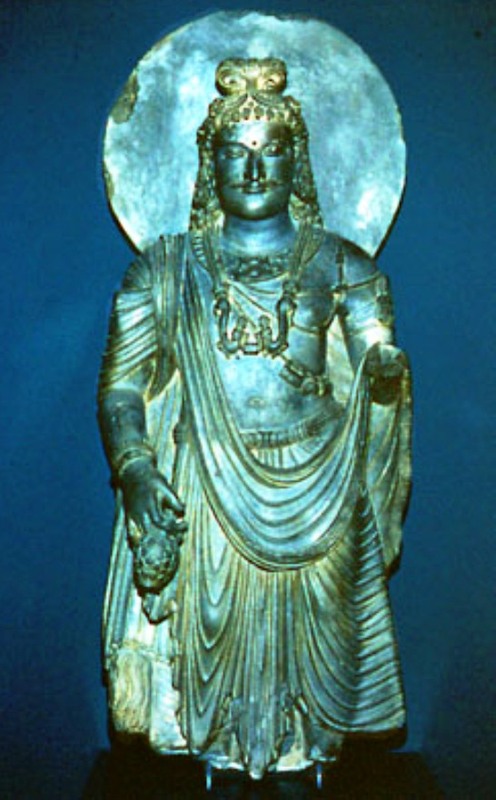 He was the sage of the Shakyas who attained the human potential of Liberation, the Awakened State known as a Buddha. In their own lands, the religion of those who practice the Buddha's teachings is known as the Dharma. Dharma means the Law of the Natural Order. Teaching and preserving the unbroken transmission of the Vajrayana Dharma has value for all humanity. Even if one is not a follower of the Dharma, its teachings can help one to understand the meaning of one's own tradition that may have become fragmented. In the Native American prophecy of the Hopi, the symbol above signifies the evolution of mankind by the return of the Elder Brother or Godhead to the American Continents. Note from the center the two wind signs, swastikas, whirling in opposite directions. If they were to expand outward along the symbol's four primary directions, they would resemble the eight spokes or prongs in the Vajra-Cross that lay on either side of the spokes in the four primary directions. These wind signs in the Hopi Sun symbol also resemble the movement of the four living creatures with their wings and wheels in the vision of Ezekiel. The whirlwinds also resemble the double helix of the DNA molecule, the spiral in the galaxies, and water as it flows through a hole. Similarly they resemble the sea of breath, the waves of inspiration and expiration that flows enlivening the heart of Man.